Last Valentine’s Day, I started my job as Director of Marketing for a SaaS software company that sells multi-channel marketing automation solutions to large distributed marketing organizations in regulated industries. One of the things that was on the long to-do list was starting a blog to develop SEO and subject-matter credibility for the company and its executives. We launched The Distributed Marketing Blog in late March, just six weeks after I began work. As anyone who’s ever started a new blog knows, it’s not easy to build traffic, SEO rank, and credibility – but we had a plan, and the plan worked. I should point out that we don’t have an ad budget for the blog, nor do we have a full-time blogger on staff — and we don’t have an outside PR firm or dedicated PR resource. Each one of the posts, press releases, and all of the supporting social media marketing to reach our goals was done on a “time available” basis, and was just one of many marketing projects that our very small team managed. Since we were also putting together a lead generation and sales support program that helped the company grow 25% in the first two quarters of the year, there wasn’t much time to spend on the blog. How did we succeed in blogging? By really, really trying — and the help of my friends at MyPRGenie and a lot of Twitter and Facebook friends who shared links to posts. We topped 117,000 readers for a post just 12 weeks after our launch (June 10, 2011). Along the way, PC World, Computerworld, The Wall Street Journal, Forbes, CNet, BNet, and even Fox News picked up our original content or linked back to our blog. 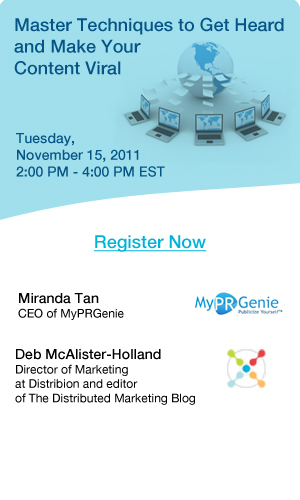 On November 15, 2011, I’ll be presenting an online master class with Miranda Tan of MyPRGenie on the tips and techniques we used to get there. I hope you’ll join us for the free webinar titled Master Techniques to Get Heard and Make Your Content Viral. If you’re a blogger or small business marketer with a good story to tell – but you don’t have an unlimited budget or a huge team who can constantly stay on the phone and manage your social media programs – then this webinar is for you. Most of the tips and techniques we’ll be covering are free, and rely far more on pre-planning, good time management, and persistence than experience or spending. I’m thrilled that Miranda asked me to present our case study with her (we couldn’t have done it without her team), and hope you’ll join us for the event! You can get more information on the MyPRGenie site, and the downloadable presentation and video from the event will be posted immediately after the webinar. Gallery | This entry was posted in Uncategorized and tagged bloggers, blogging, blogging best practices, blogging metrics, blogging tips, building blog readership, Deb McAlister-Holland, finding free art for blogs, Miranda Tan, MyPRGenie, PR for bloggers, PR tips, social media marketing, The Distributed Marketing Blog. Bookmark the permalink.